Cordine McMurray was born in 1940 in Detroit, Michigan. He enlisted in the U.S. Army on July 29, 1958, and completed Basic and Advanced Individual Training as an Infantryman at Fort Knox, Kentucky, in October 1958. His first assignment was as a Rifleman with Company C and then A, 13th Battalion, 4th Training Regiment of the U.S. Army Training Center at Fort Knox from October 1958 to April 1960, followed by service as an Auto Rifleman with Company D, 2nd Battle Group of the 10th Infantry Regiment at Fort Davis in the Panama Canal Zone from April 1960 to August 1962. Sgt McMurray served as an Auto Rifleman with Company C, 4th Battle Group of the 10th Infantry Regiment at Fort Davis from August 1962 to April 1963, and then as an Auto Rifleman with Headquarters 4th Engineer Battalion at Fort Lewis, Washington, from April to October 1963. His next assignment was as a Gunner with Company A, 1st Battalion of the 12th Infantry Regiment at Fort Lewis from October 1963 to May 1964, followed by service as Assistant Supply Sergeant with Headquarters 1st Battalion, 12th Infantry Regiment from May 1964 to June 1966. 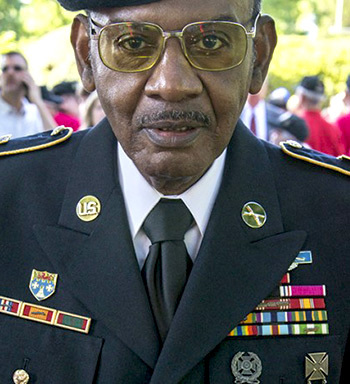 He served as Supply Sergeant for Battery C, 4th Battalion of the 42nd Artillery Regiment at Fort Lewis from June to July 1966, and then deployed with his unit to South Vietnam from July 1966 to February 1967. Sgt McMurray then joined Company B, 1st Battalion, 12th Infantry Regiment of the 4th Infantry Division as a Team Leader and then Squad Leader in South Vietnam from February 1967 until he was captured and taken as a Prisoner of War on July 12, 1967. After spending 2,064 days in captivity, SFC McMurray was released during Operation Homecoming on March 5, 1973. After recovering from his injuries he served as a Platoon Sergeant and then Operations Sergeant with the 108th Military Police Company at Fort Bragg, North Carolina, from September 1973 to July 1974, followed by Non-Commissioned Officer Advanced training and Military Police Investigations training at Fort Gordon, Georgia, from July 1974 to January 1975. His next assignment was as Operations Sergeant and then 1st Sergeant with Headquarters, Military Police Brigade, at Fort Gordon from January to August 1975, and then as 1st Sergeant of the Military Police School Battalion at Fort McClellan, Alabama, from August 1975 to January 1976. 1st Sergeant McMurray served as Senior Instructor with Company B, School Battalion of the Military Police Brigade at Fort McClellan from January to November 1976, and then as Operations Sergeant with Company A, 9th One Station Unit Training (OSUT) Battalion of the U.S. Army Military Police School at Fort McClellan from November 1976 to February 1977. His next assignment was as 1st Sergeant of Company D, 9th OSUT Battalion at Fort McClellan from February to December 1977, followed by 1st Sergeant of the 58th Military Police Company at Fort Bragg from December 1977 to March 1979. MSG McMurray served as Operations Sergeant for Headquarters 16th Military Police Group at Fort Bragg from March to May 1979, and then as Operations Sergeant for Headquarters 89th Military Police Group at Fort Hood, Texas, from May 1979 to March 1981. His next assignment was as Provost Sergeant with the 256th Military Police Company at Fort Hood from March 1981 to August 1983, followed by service as Operations Sergeant for the 2nd Military Police Group in West Germany from September 1983 to September 1985. Sergeant Major McMurray served as Operations Sergeant of the 18th Military Police Brigade in West Germany from September 1985 to May 1986, and then as Command Sergeant Major of the 93rd and then 709th Military Police Battalions in West Germany from May to October 1986. His final assignment was as Assistant Commandant of the U.S. Army Military Police Non-Commissioned Officer Academy at Fort McClellan from November 1986 until his retirement from the Army on July 1, 1988. Sergeant First Class Cordine McMurray distinguished himself by exceptionally meritorious service to the United States of America while detained as a Prisoner of War in Southeast Asia during the period 12 June 1967 to 5 March 1973. His ceaseless efforts, by a continuous showing of resistance to an enemy who ignored all international agreements on treatment of prisoners of war, in the extremely adverse conditions of the communist prisons of Southeast Asia demonstrated his professional competence, unwavering devotion and loyalty to his country. Despite the harsh treatment through his long years of incarceration, this American continued to perform his duties in a clearly exceptional manner which reflected great credit upon himself and the United States Army.